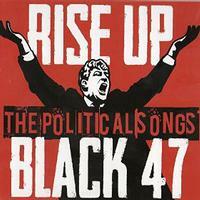 This album is a collection of Black 47 political songs. The group have always been big on doing political songs, so there are plenty from which to choose. These are remixes and rarities, though. So, while I’ve reviewed some of these songs before, I think these versions are all different from the ones I’ve originally reviewed. That said, I’m going to include the original review at the end of the track review for the versions here, so you can compare and contrast. As to the full package, with Black 47 closing up shop, this is a fitting compilation. The earliest political song from Black 47, this is a bit stripped back in arrangement. It’s still got their classic Celtic rock vibe. This is a bit of rethinking of an early Black 47 rocker. It works quite well in this new format. I love the musical arrangement and the vocal performance has some great anger to it. I love the horns and reggae vibe on this cut. It’s a great tune. In might be my favorite here in a lot of ways. There is definitely a bit of a Dixieland element later, too. This is a fun Celtic rocker with a historic slice of lyrical magic. I love just about everything about this piece. It’s a killer rocker. The opening on this is an acapella, rather operatic female vocal. It isn’t the kind of thing I really like, so it kind of leaves me a little less than impressed. As it powers out into a powerful Black 47 arrangement, though, this really works very well. When those vocals come across the musical arrangement later, it’s more effective. They drop it back to mellower sounds for one section of Kirwan’s vocals. Then it powers back out from there. In some ways, this song, despite that introduction, is one of the best numbers here. I love this cover. When you are going to cover a song, you need to make it your own. Black 47 definitely does that here. If you’d never heard the original, you’d think this was a Black 47 song. The powerhouse female vocals really add a lot to this. It seems like this one has it all. Mellower sections are heard. More rocking ones are included. It even gets some of those operatic female vocals and a parental advisory for the lyrics. It’s a strong cut that’s one of the most complex numbers here. Another with a fairly complex arrangement, I like this one a lot, too. It really gets very jazzy mid-track, but overall this is definitely Black 47. There’s a bit of an Irish rap on this. That was pretty common in the band at one time. There are also a lot of jazzy elements, and this has a bit of space rock element. This is an acapella reading of the real will of a gentleman named Joe Hill before he was executed. I love the hard rocking sound that opens this. It works to a more stripped back arrangement from there. This rocker has some jazz and more in the mix. It has a real classic Black 47 vibe but with a modern twist.